I started following Addicting Info sometime around 2011. Finally! Someone’s saying all the things I’d been screaming at the TV for decades as the pundits talked about “trickle down,” “free markets,” “makers and takers,” and “balanced budgets” as though they were sacred truths… All the while giving equal airtime and credibility to climate change deniers and racist dog whistlers. Then one day in 2012, the managing editor posted on Facebook that they were looking for writers and editors and I jumped on it. I’ve always been obsessed with politics and debunking Fox News lies, so it was a perfect fit. 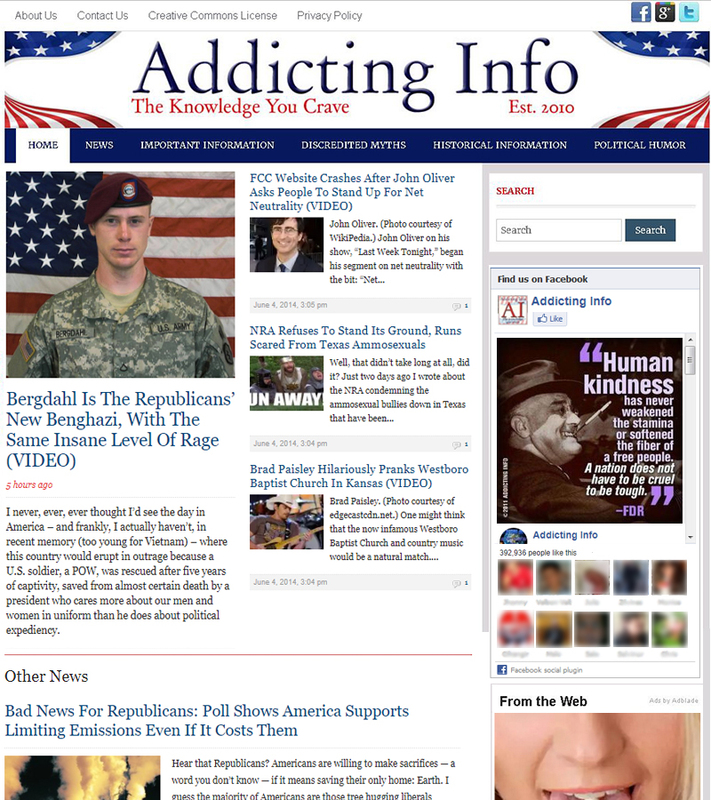 To see my writing for Addicting Info, see the News & Politics section of my portfolio. After a couple of years, it occurred to me that the site could benefit from a more polished look. 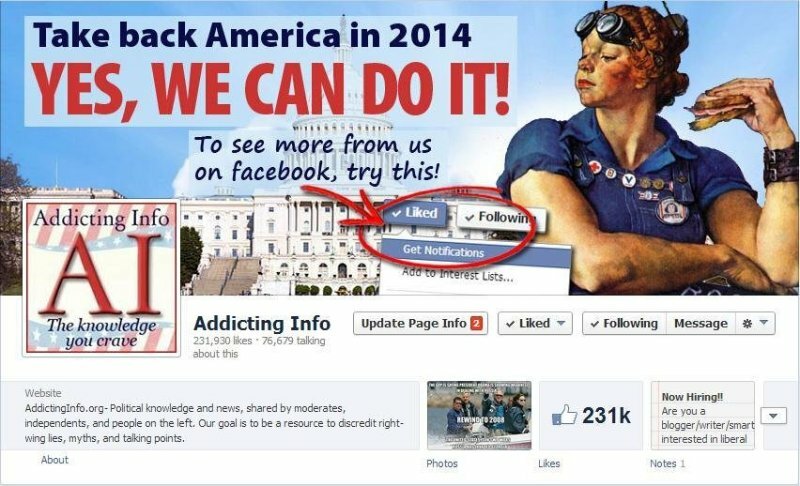 By 2014, the site’s Facebook following had grown to over 200,000 followers. 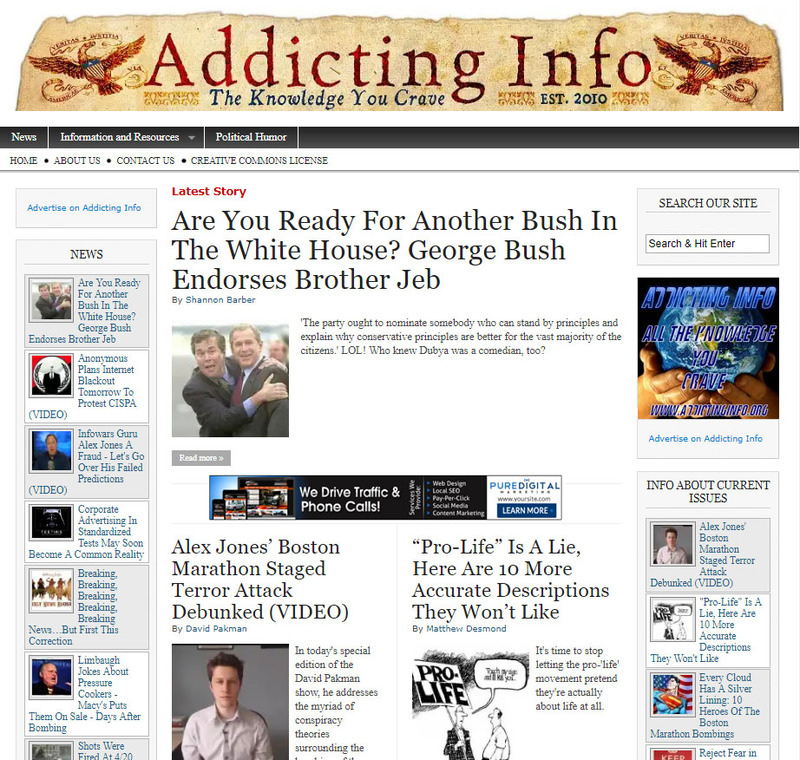 This is how the page and masthead originally looked. Since we were getting millions of visitors each day, we wanted to avoid any major changes that would increase the load on the server. I stuck with a new masthead graphic and some tweaks to the WordPress theme and CSS style sheet. I also added a new profile picture and cover photo to the Facebook page. At the time, Facebook made a major change to its algorithms. We, therefore, needed the cover image to encourage our followers to change their notification settings so they’d keep seeing us in their feed.